In 2010, the presidents of Peru and Bolivia established a bilateral commitment to pave more than 300 km of the highway between Tacna (Peru) and La Paz (Bolivia). The initiative aims to strengthen bilateral integration and make this into a major route for bilateral trade and the transit of people and vehicles towards the Pacific Ocean (Ilo Declaration, 2010). The countries’ commitment to the project was confirmed in 2015 at another presidential meeting which ministers from different areas also took part in, based on the understanding that this road corridor contributes to the social and economic development of people living near the border. To this end, those present drafted a binational action plan to complement and support the paving of the highway, which includes specific work groups and activities on the environment and cross-border water resources; security and defense; economic development, social policies, and institutional strengthening; and integration and development infrastructure (Isla Esteves Declaration, 2015). The highway crosses Tacna Department in Peru and La Paz Department in Bolivia. Together, the two departments have a surface area of 150,000 km² and are home to 3.5 million people. They have a combined GDP of over US$10 billion, according to 2014 estimates (COSIPLAN, 2016). This integration road corridor is made up of two road projects from Project Group 5 of the Central Interoceanic Hub in the COSIPLAN Portfolio (link in Spanish). In Peru, the highway connects the city of Tacna with Collpa on the border with Bolivia, where it stretches from Hito IV to La Paz. Both projects have been divided into sections for the paving work. On the Peruvian side, the Tacna–Collpa highway is divided into four sections, the first of which (up to Km 43.6) is paved and asphalted. The second section is 50.4 km long and represents an investment of US$79 million. Work began in August 2016 and will be completed in February 2018. The third section is 52.2 km long and represents an investment of US$43 million. Work began in September 2016 and will be completed in April 2018. 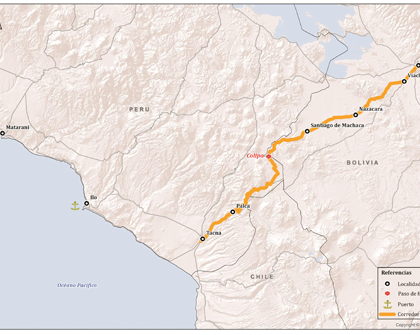 The final section, which reaches the border with Bolivia, is 41.2 km long and represents an investment of US$45 million. Work began in February 2016 and will be completed in October 2017. In Bolivia, the La Paz–Hito IV highway is also divided into four sections and the first of these is paved up to the Capiri Rail Crossing. The second section, which runs between Capiri and Central Chama is 25.25 km long and represents an investment of US$16 million, which was financed by CAF. Work on it will be completed in February 2018. The next stage entails paving the 27.44 km of road between Central Chama and Nazacara. Work on this section is also underway, representing an investment of US$21 million, and will be completed in 2017. The fourth section, which connects Nazacara and Hito IV, was divided into three subsections. The contracts for work on the first two have already been awarded. The first subsection runs the 25 km between Nazacara and San Andrés de Machaca and represents an investment of US$32 million, financed by FONPLATA. The second subsection is the highway between San Andrés de Machaca and Santiago de Machaca, which is 32.7 km long and represents an investment of US$37 million, financed by the IDB. Finally, the Santiago de Machaca–Hito IV subsection, which is approximately 50 km long, is currently being tendered and will represent an estimated investment of US$66 million. This connection with the Peruvian coast is complemented by two other projects from the COSIPLAN Portfolio. The construction and upgrading of the Camaná–Matarani–Ilo Road is currently underway. The project represents an estimated investment of US$438 million and will improve connectivity between the ports of Ilo and Matarani. Work will be completed in April 2017. The second project is the expansion, upgrading, and modernization of the Port of Ilo, which aims to establish the port as a modern, multipurpose terminal. A private initiative is being evaluated for the design, construction, operation, and maintenance of the terminal. It represents an estimated investment of US$230 million. [V1]Soledad: esto está bien? Si ya se concluyó, habrá que cambiar la frase: Work was completed in April 2017.